Our array of heaters also equips Plastic proof Nozzle Band Heaters for taking care of needs. The heaters lend outstanding output and provide warmth in highly efficient way. The heaters are available at market leading rates. Sheathing material high grade steel or brass. 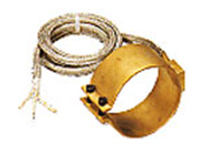 Operating temp brass 280°C – SS 350°C. Max. surface load Brass 30w/sq. inch, SS sheath 45w/sq. inch. Metal braided Fiberglas wire terminals.